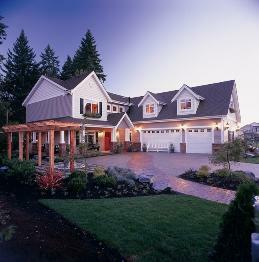 Cedar Select ® Shingle Siding takes performance, style and dependability to a new level. And with two eye-catching shingle profiles to choose from — a rough-hewn Hand-Split Shingle and a classic Perfection Shingle — you can have the look you want with the low-maintenance ease you deserve. From its broad palette of colors, its durable finish and its realistic wood grain appearance, Cedar Select Shingle Siding can finish your whole home, or add dramatic accents to porches, gables and other architectural accents. Cedar Select ® Round Cut Siding provides the authentic look of “fishscale” shingles without the expense or hassle of wood. And, because it’s from Napco, you know you’ll get the performance, style and durability you’ve come to expect.